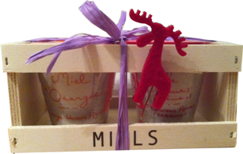 2 of our fantastic honey in a wood gift set box, finished with a ribbon and red reindeer. Taste this honey coming from the orange blossom fields of Spain. Typical honey from the sunny Mediteranean region of Spain.